From the high tea sets found at The Peninsula, to the quirky Nordic-inspired mid-day nosh at FINDS, we’ve got you all set with our complete list of the best high tea spots in Hong Kong. MO Bar is truly multifunctional: a cocktail lounge, brekky buffet pad, and now an afternoon tea hotspot. Their Polar Afternoon Tea is no different. Filled with afternoon favourites including Smoked Salmon & Roe with crispy filo & wasabi tarama, Foie Gras Mousse dipped in cherry Jell-O & beetroot marmalade, it’s a perfect place to camp down mid-day. Situated just steps from Cheung Kong Center and the Bank of China Building lies SEVVA. We all know about the gorgeous views offered from the rooftop terrace, but it’s the afternoon that SEVVA really puts the eye into eye candy. What’s super special about SEVVA has to be the chocolate-fudge marmalade cake, and—wait for it—the double chocolate-dipped strawberries. The Mandarin Oriental’s decadent high tea set features a romantic atmosphere and attentive, white-gloved service in the heart of Hong Kong. Look for three-tiered displays chock full of oolong teas, grilled cheese and truffle sandwiches, and scones with rose petal jam. With floor-to-ceiling windows facing Hong Kong’s iconic harbourfront, The Lobby Lounge, serves a variety of dishes including crab with salmon roe tart, toffee cake, raspberry scones, and more. With a menu featuring classic Chinese and western tea blends by Mariage Freres, it’s hard not to resist. If you’re looking for afternoon tea, with a view, Café 103 at The Ritz-Carlton fits the bill (theoretically and metaphorically). Perched 100+ stories high at The Ritz-Carlton, Café 103 features savoury treats thanks to a parade of world-class chocolatiers whipping up cakes, tarts, biscuits—you name it. Beware: lemon meringues over vanilla sable are seriously addictive. 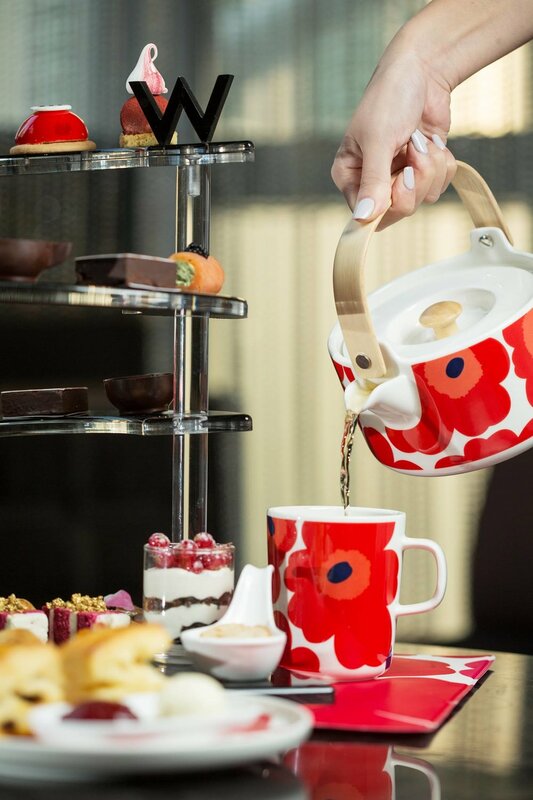 There is really nothing more quintessentially British than afternoon tea at the iconic Peninsula Hotel in the heart of Tsim Sha Tsui. With a live string quartet, look for British classics including freshly baked pastries (i.e. scones with clotted cream). They don’t take reservations here, so be sure to line up early to snag a table! Fresh-faced Palm Court at The Langham has recently been spruced up after its London outpost, where traditional English Afternoon Tea at the Wedgwood was served more than 150 years ago. Staying true to its heritage, Palm Court offers cakes, éclairs, and more sweet treats. Wash it all down with a selection of Ronnefeldt teas that is yours for the choosing. The best places to eat and drink delivered to your inbox. We don’t spam. Pinky promise. Seasons’ tantalizing French fare might be just what you need for a Parisian-themed spread. Look for delish sweets such as homemade scones, Parisian scones, foie gras stuffed mushroom, and the like. Every time we pass by Robuchon’s Le Salon de Thé, it’s packed to the gills, with a meandering line just outside. Arrive early, and get your helping’s worth of French pastries (think: pillowy macaroons, fine teas and the lot). Live entertainment and tropical gardens beckon at Island Shangri-La’s Lobby Lounge. With afternoon tea classics such as Fresh Lemon Tart and Smoked Salmon Roulade with Crab, Island Shangri-La’s Lobby Lounge dishes a decadent signature tea set for even the most discerning of palates. Go on, treat yourself. Look for a chic, yet world-class service at the Four Seasons’ The Lounge. With classics including freshly baked scones, puff pastry, and fresh mint gelato, what’s not to love? Add an extra dash of decadence through a cup of hot chocolate alongside your pretty-as-a-picture tea set. beyond in its nest at the Grand Hyatt. Plus, knock down three distinctive and themed afternoon tea sets for our afternoon tea lovers. First up has to be the “Sam Dim Sam” set featuring Grand Café’s signature Hainanese Chicken Rice, BBQ Pork Puff Pastry, as well as “must-try” local favourites such as Milk Tea Ice Cream Coupe with sago and ginger jelly and Hong Kong Milk Tea. Next, there’s the Lobsterlicious Tea Set featuring everything lobster-related. Lobster Claw Cocktail. Lobster Bisque. You get the point. Tuck down post-meal with some Mango Pudding (thankfully not lobster-themed). Finally, there’s the third afternoon tea set to choose, adeptly named, “T-T-T” or “Tea Time Toasties.” It’s all about carbs, carbs, and more carbs here. Look for a trio of toasties (think: Chicken Avocado Toasty, Bacon, Pizza Toasty with Tomato, Salami, and Cheese, and Ham and Cheese Toasty with black truffles). The Banana Split Ice Cream Sundae just ticks all the right boxes. Sip on refreshing Ronnefeldt tea or freshly brewed coffee (with a choice of 8!?! types of sugar) at Marco Polo’s afternoon tea offerings in the heart of Tsim Sha Tsui. With a three-tiered platter of petit fours, and assorted desserts to savour, Marco Polo is the perfect pad post-shopping spree at Habour City. COCO Café’s Patisserie puts a Parisian spin to your afternoon favourites. Look out for the delish beetroot and raisin scones as well as the blueberry pomegranate tea—the selection is diverse enough to satiate even the most discernable of tea palates. This one gets brownie points from us for the ever-changing selection—there’s always something “nouveau” every month. Nestled in the posh confines of Upper House in Pacific Place, Café Grey dishes out adorable nibbles (think: coconut chocolate pavé, smoked salmon on pumpernickel, white chocolate muffins, rhubarb-yogurt coupe, and more) thanks to Michelin-starred chef Gray Kunz. Complete with a warm selection of freshly baked breads, served alongside clotted jam, why mess with the classics? WOOBAR’s TEA-SE Me cocktails dazzles diners with 30+ desserts in its afternoon tea buffet, which also includes all your classic high tea offerings (think: lollipop and pistachio cake, cherry confit with lemon gel, and more signature savories). Look, one’s not gonna to be full eating one measly scone, so just fill your plates up at the buffet. Who’s judging? Above & Beyond isn’t the only pad at Hotel Icon offering afternoon tea. In fact, it’s ground floor counterpart, GREEN, offers staple signatures such as Mini Tartlets, Truffles, Cupcakes, and the like. Choose from teas, which include Ceylon Orange Tea, Himalayan Darjeeling Tea, Verbenea Mint, and more! Nestled in a 19th century explosives compound, AMMO, is probably one of the more unique places to knock down an afternoon tea (or two). The simple tea set at AMMO offers savoury bites such as Wagyu beef burger, scones with jam, and bamboo charcoal bun. European mainstay, The Continental, dishes a delectable spread of afternoon delights including Ham & Cheese Toasties, Salmon Rillettes Sandwiches, and more. Make sure not to miss the Tuna Salad on Brioche as well as the Grilled Vegetables on Baguettes as well. With coffees and seven types of teas to choose from, it’s not surprising that we can stay here for hours on end. Feel like you’re whisked away to Ho Chi Minh with Le Soleil’s Vietnamese-inspired afternoon tea set. Tuck down a few Vietnamese morsels (think: Saigon-style spring rolls, rice-paper rolls with soft-shell crabs, and Vietnamese sausages). Throw back a few sips of iconic Vietnamese iced-coffee, and you’re all set for the day. FINDS—which stands for Finland, Iceland, Denmark, and Sweden—offers a spread of Nordic afternoon tea delights, such as cellar salmon with dill sauce and mini pancakes with raspberry. But, if you’re looking for an afternoon pick-me-up, FINDS offers a range peach mimosas to throw back. The offerings on tap at Urban Park’s Afternoon Tea aren’t your usual clotted scone and French croissant same old. In fact, you’ll be hard-pressed to find them elsewhere: baby marshmallow tree, no-bake blueberry cheesecakes, tomato salsa shooter. Cue the IG feed! If waiting in line for 2 hours is your cuppa’ tea, Lady M’s is the place for you. With their all-day cake set clocking in at $298 for two, it’s great value for money. With signatures as their Mille Crepes, Green Tea Checkers Cake, and Strawberry Shortcake, Lady M melds Nikkei and French inspirations in its cakes. Don’t miss the Brie & Fig Tart. Figgin’ brielicious. This place is a bit scammy. We get it. You are only fed a few measly morsels here, but we digress. It’s better to focus on the 800 or so varieties of tea from around the world here. Plus, who doesn’t like to be watched (and be gawked at) while you’re slurping down some Darjeeling and tucking down a patisserie? Look, rent’s due at the end of the month, so Hotel Indigo offers the best bang for your buck, afternoon tea-wise. Sift through a range of teas and coffees from their menu: Tiramisu Cappuccino, Almond Mocha, White Caramel Mocha, and more. Paired alongside petite sandwiches, freshly baked scones, it’s an awesome way to rock out the work week. Open-faced sandwiches? Check. Rustic home-made cakes? Checkity check. Nestled in the heart of Taikoo, Feast, dishes up an afternoon tea set during the week, as well as an afternoon tea buffet on weekends. With all your afternoon tea buffet treats, and then some (Prosecco jelly, anyone? ), what’s not to love at this Taikoo stalwart? Nestled on the 3rd floor of The Pottinger Hotel, The Envoy features modern colonial influences in the heart of Hong Kong. With a three-tiered Colonial High Tea Set chock full of the sweet treats such as deviled eggs, prawn croissant, and the pickings, The Envoy is all about colonial influences in the heart of Hong Kong. For those looking for a bit of adventure, Tai O Heritage Hotel is a journey away from the Island, but well worth the experience. Featuring a Taste of Tai O set with crunchy chicken wings and a dash o shrimp paste, Tai O Heritage Hotel’s Tea Set is something truly unique thanks to its idyllic and serene location.